LARRY MAYER/Gazette Staff Mark Wollenburg, left, and Shawn Hickey install a new sign at the offices of Kampgrounds of America in Billings. RVs leave the Billings KOA, billed as the first KOA. Cabins are among the offerings at the Billings KOA. Billings isn't home to more than a few multi-national corporations, but one of the oldest is celebrating its 40th anniversary this summer. Unlike many U.S. corporations in the news, the privately owned Kampgrounds of America Inc. is doing just fine financially, thank you. 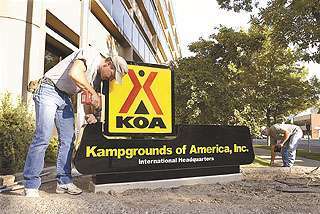 KOA operates nearly 500 campgrounds throughout the United States, Mexico, Canada and Japan and employs 70 people at its headquarters in the TransWestern III building in downtown Billings. During the peak summer season, the company employs 300 people systemwide. The Sept. 11 tragedy has changed the way we live. Even with the dramatic stock market downturn, people turn to camping for an affordable vacation. At the same time, the loss of equity means potential franchisees of KOA may have a tougher time coming up with the cash. Still, Rogers said Montana and the Dakotas are having a great summer and stable gas prices are helping. "People are able to hit the highway, buy gas and reach these longer destinations, which is good for us and good news for everyone," he said. The Travel Industry Association of America reports that 87 percent of travelers who took a trip last year are going to take at least one other trip this year. That's up from 79 percent in 2001. The association also said tourists are spending 9 percent less money on their primary vacation this year, an average of $1,066, compared to $1,172 last summer. Today, 7 percent of American households own an RV or recreational vehicle. Two years ago, a record number of 300,000 RVs were shipped to buyers. And that may continue. As folks age, they buy more RVs. In the age group 50 to 65, 14 percent own one. Since the 50 to 65 age class will jump by one-quarter as Baby Boomers age in the next decade, those statistics sound sweet to Rogers. Facts about camping There are 12 million RVs on the roads in the U.S.
More than 90 million Americans camp every year. One of every three American households with kids under age 17 have camped in the past year. KOA's directory and Kampground guide is distributed to 1.6 million campers each year. "The anticipation is, people who have money and time and love to travel will increase and we'll have a bright future," Rogers said. Businessman David Drum started the first campground in 1962 on his land along the Yellowstone River to tempt some of the baggage-filled cars heading to the Seattle World's Fair to spend some money in Billings. Another campground was built in Cody. The next year, Drum and two partners named the business Kampgrounds of America and started selling franchises around the country. By 1972, KOA operated 600 campgrounds, before the Arab oil embargo of 1973 and '74 slowed travelers. By 1982, KOA operated nearly 900 campgrounds, but stricter quality standards started weeding out many of the campgrounds. Today there are 500. Shane Ott, who has worked 16 years for KOA and now is vice president for company-owned properties, said that of the nearly 500 campgrounds, most are franchises that depend on the interstate highway system and RV traffic. But KOA is buying and owning more campgrounds. "We've added five properties within the last two years, so it's been a pretty healthy clip," Ott said. KOA campgrounds aren't just a collection of tents. They offer cabins and cottages as well. The corporate properties are more upscale, he said. The corporation has invested $10 million in five campgrounds recently, including a 450-site campground near Opryland Hotel in Nashville, Tenn., one at the gateway to DisneyWorld and a campground in Niagara Falls, Ontario, purchased in April. One California campground, Ott said, attracts half of its business from the Silicon Valley where dot-comers can enjoy an inexpensive vacation with just a two-hour drive. "Systemwide, KOA registrations year-to-date, are up about 8 percent and we are very excited about that level of growth, Rogers said. Folks trying to keep and attract industry to Billings like companies like KOA. Al Jones, regional development officer in Billings for the Montana Department of Commerce, said KOA attracts other work into Billings and that's a model he's trying to duplicate. "They're the kind of company we'd like to have a lot more of. They are all good jobs," Jones said. "They are a really good corporate citizen." KOA brings in new business and spawns other companies in Billings because it is the home office to hundreds of campground franchises, he said. "We think they're great because they are a franchiser, which is a model we think we can use more of in Montana," Jones said. "Everything flows back to corporate including printing, design, IT (information technology), so it brings very good work to Billings and provides a whole network of suppliers." Sir Speedy Printing Centers started out as KOA's in-house print shop, Jones said. West Advertising is another spin-off company. Beside KOA, Jones said other multi-national companies based here including Corporate Air, which flies routes throughout South America and the Caribbean, and the former wagering company started in Shepherd, United Tote. Hall and Hall Inc., a real estate firm, is selling large ranches in Argentina and Australia, Jones said. Many campgrounds are disappearing across America into parking lots as urban sprawl continues. So the fastest way to grow KOA campgrounds, Rogers said, isn't to buy 20 acres and build one, but to capture some of the existing 8,000 mom-and-pop outlets. "What we now have is an aggressive effort," he said. "We have people in the field visiting the campgrounds and sharing with them the proprietary benefits: Computer systems, marketing that they can't do on their own and that they need." KOA hired a husband-wife team who own a franchise in Buckeye Lake, Ohio, just east of Columbus to recharge sales efforts. Carol and Walter Preble can share their own experiences when talking to independent campground owners about joining KOA, Rogers said. Those benefits, he said, include 1.6 million names of campers and 1.7 million folks on a direct mailing list. For marketing and other help, franchisees pay KOA 8 percent of their registration fees. Building a new KOA campground can cost between $805,000 and $1.8 million. Converting one costs between $49,600 to $282,500. Initial franchise fees run between $22,500 and $30,000. Campers are expecting better perks than they did 30 years ago, Rogers said, which independents have trouble doing. "Folks getting by in the '70s and '80s are going to have to step up and offer the basic amenities the traveling public expects," he said. KOA considered moving out of Billings to Rogers' hometown of Reno, Nev., two years ago, but decided to stay. Rogers maintains homes in both cities. His family still lives in Reno. The decision to stay is working out well, he said, because the services his corporation needs are right here. KOA uses Fenske Printing for online marketing and printing along with other national firms. Connect Telephone & Computer Group manages up to 1,000 switchboard calls per day. Sutton's Sportwear provides specialty clothing. Billings can be the Silicon Valley of camping, Rogers said.